Space exploration is still a mind-blowing concept until now. Sending people into space and even exploring nearby planets in our solar system is a feat in itself and for years, humans persisted in pushing our technology further so we can reach farther planets and do more extraordinary things in space. In order to do so, high-tech computers are used that are capable of performing a myriad of tasks at once that an ordinary person isn’t capable of doing. Harnessing space technology is our only ticket to understanding the vast realm of space and what lies beyond what our naked eyes can see. When SpaceX’s next mission launches on August 14, it won’t just be carrying supplies to the International Space Station (ISS). NASA has partnered with HP to perform a long-term experiment on how high-end, modern computers will perform in space compared with on Earth. Space, as you may or may not know, is absolutely murder on electronics. Cosmic rays are sufficiently plentiful that astronauts since the 1960s have reported seeing flashes of light when their eyes are closed, and there have been no flashes within the capsule, shuttle, or space station. It’s believed that this is caused by cosmic rays passing through the retina. The ISS isn’t protected at all by Earth’s atmosphere, and while it still receives substantial protection from Earth’s Van Allen belts, the total radiation exposure that an astronaut on the ISS receives in a week is equivalent to what a human on Earth receives in a year. At one point, the ISS passes through the far edge of the inner Van Allen belt, and the crew receives 30x more radiation than they would otherwise during this interval. Yet even if the world has been sending astronauts into space for decades now, we can’t deny that the risk is still there and they can die in an instant if something goes wrong. All the movements of the aircraft are controlled by computers from the moment they leave earth until they return. It’s the same even in manned missions. 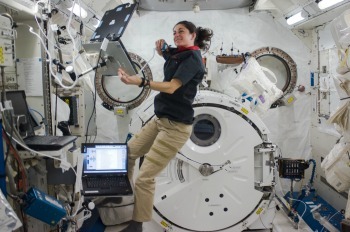 Computers play a huge role in the management of life support systems in space. Without them, no human being can survive in such harsh environments. The idea behind the experiment is to use software and a custom-built enclosure to test a regular server computer’s ability to withstand cosmic radiation and solar flares. Normally, computers used in space flight and exploration are “radiation hardened”through expensive hardware, which can take years to develop, test and produce. Computers are the key to successful space explorations. But a myriad of factors also affects the way these modern contrivances work outside our planet. Humans may be ambitious and come up with all sorts of antics to reach for their dreams but not without the right tools in hand. Space technology needs all the help it can get today especially that modern consumer gadgets are much better and far more advanced than the ones used in space. With this initiative by SpaceX and HP, they’ll be able to advance the use of computers in outer space and find out for real how modern computers and electronics fare when they’re not used on land but on the International Space Station.